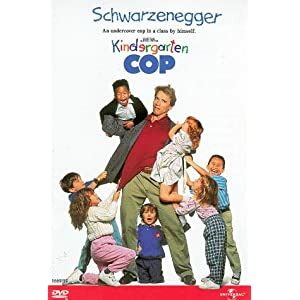 Kindergarten Cop is a comedy directed by Ivan Reitman. Arnold Schwarzenegger stars as Detective John Kimble, who is going undercover as a Kindergarten teacher to find and catch a drug dealer. This film is hilariously funny because of Arnie's thick accent and the lines he delivers. Here's an example of something he says to his kindergarten class. "We're going to play a wonderful game called... 'Who is my daddy and what does he do?'" The real humor comes from the kids, of course. This is what one girl says during the game. "My daddy works on a computer all day, and is the head of his company and he, um, he has a moustache and a beard, and he-he doesn't have a lot of hair, and cuz-um, since his head is so big, he can't wear any hats." This wonderful comedy is a great gift for him.